I had never heard of Altmetric, but on looking at their list of the top 100 papers of 2015, paper number 100 had a score of 854 (top had 2782). Fame still awaits. Paper 100, incidentally, was “Human language reveals a universal positivity bias.” Not at this blog, buster. Has been viewed more than 3,000 times and is still very popular on social media (see below). The link to the official paper is above (here too). The original post about it is here. The book page for Uncertainty, which contains all the meat and proofs of contentions in the paper, is here. Uncertainty can be bought here. Don’t miss the free Data Science course, which puts all the ideas of the paper into action. This course is neither frequentist nor Bayesian nor machine learning/artificial intelligence, but pure probability. Just look at that! 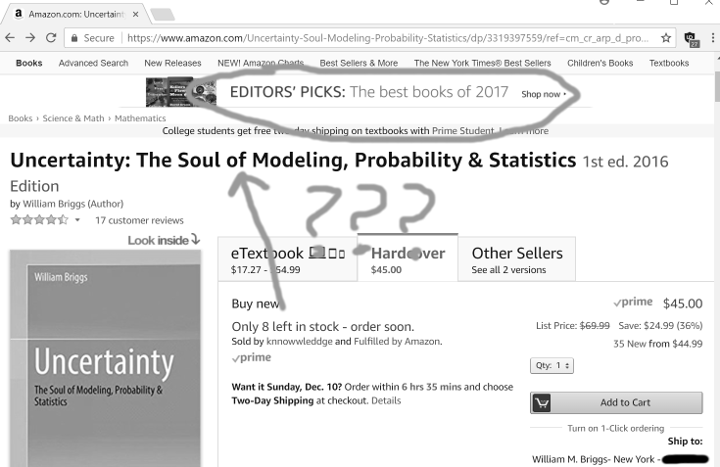 The editors “best books” next to readers’ favorite book. The p-value measuring this correlation must be mighty wee! Weer than wee! Wee wee. All the way home! That is a “positivity bias.” And it IS here on this blog. I looked through that Altmetric list of the top 100 papers and was surprised to count only 5 on the subject of climate change. Congratulations such metrics actually reflect something. ( whether it’s something we sought after, approve of, or will have permanent relevance is a different issue). After that glowing praise I’m going to buy the book. How do I get it signed by the author? I’m not going to read “Human language reveals a universal positivity bias.” But I’ll bet dollars to donuts that there are p-values lurking somewhere within its analysis of human languages. Because how could anyone do real science and find important Findings like “we tend to think very highly of ourselves,” without p values? Huh? Huh? Good question. The XYL suggested bookplates, signed and which you could glue into the book. That sound good?